This announcement once again concerns the funds stored at CryptoGames, in regard to our handling of events during which funds are split into several co-existing blockchains, like it was the case in the past with the splits between BTC/BCH, BTC/BTG or ETH/ETC. In our previously announced policy and as a result of our current cold wallet solution built around a Ledger Blue hardware wallet as core element, we had stated that CryptoGames would only support or distribute those forks that are available on the Ledger Blue (thus have their own ledgerwallet app). 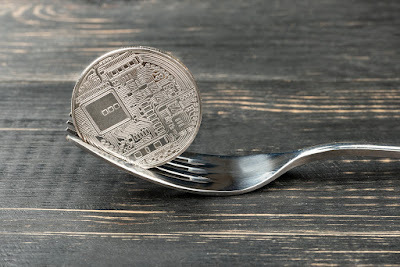 However, since there is almost no way of knowing which fork will be picked up and added to the group of coins supported with Ledger Software and which one will not, this policy resulted in us still having to prepare for each and every fork, with the possibility of it eventually coming to the Ledgers and us having to distribute the funds at this point. Those preparations are both time and work intensive, while often leading to no avail. At the time when we announced our support for split-coins, there were only a handful of them and the projects had credibility and longevity. Since then, the situation has slightly changed. To give you an idea of what this means, especially in terms of preparation needed on our end, besides BCH and BTG, which were both distributed by CryptoGames, there have been a total of at least 28 bitcoin minority forks in the last nine months (and that list only collects forks of BTC, not any other coins currently available), including projects such as “Bitcoin Interest”, “Bitcoin Cash Plus”, “Bitcoin Pizza”, “Bitcoin SegWit2X X11”, “Bitcoin God”, “Bitcoin Hot” or “Bitcoin Clashic” (not a typo). Despite their names, all of those are not pure jokes and legitimate bitcoin forks. Another concern when handling split-coins and distributions is the privacy of our users. We offer gambling and investing with Monero/XMR (a truly anonymous blockchain), and many of our users rely on us to respect and protect their privacy when they send XMR to our wallets or receive XMR from our wallets. In case of XMR, the recent upgrade to protocol version 12, Lithium Luna, resulted in a split with several alternative chains remaining on the previous version 11, which has no adjustment to fight ASIC mining. The list of split chains includes, but is not limited to, XMO (Monero Original), XMC (Monero Classic) and Monero Zero (XM0). There is also an unrelated XMR minority-fork planned under the name MoneroV (XMV). The situation of splits occuring on XMR creates a conflict of interest for our team. While we want to give users access to their funds on all those alternative blockchains, we also understand our responsibility in regards to protecting the anonymity of funds stored at CryptoGames, and in connection to that, the anonymity of everyone interacting with CryptoGames via the XMR blockchain. The problem however is, that accessing the funds on XMO, XMV, XM0, or XMC would weaken this anonymity, as private key reuse is a threat to Monero’s mixin anonymity model, which was previously explained by the XMR team in this blogpost and discussed in this thread. In result of this, we’re facing a decision between anonymity and accessibility. While a single user can make this decision for themselves, we do not think we should make the decision for everyone and force it onto all users. However, there is only one way to let users individually decide how they want to handle situations like these. Both reasons listed above, the concern for effectivity and the concern for anonymity, lead us to a now changed policy about hard forks and their resulting split-coins. From now on, CryptoGames will no longer distribute any forked coins as default policy. There might be exceptions in single cases, we might still choose to distribute some split-coins, but the general agenda for minority forks is, users who want to have access to their coins on the forked chain will have to withdraw their funds in advance of the split, hold the funds on their own during the fork, and can deposit the coins that are further supported by CryptoGames once again after the fork occurred, while staying in full control of their funds on split chains no longer supported. This change of policy opens up a lot of workhours previously used and wasted with the many minority forks, most of which since vanished or have been forgotten about. Those hours can now be used to improve the site everyone is using day to day. Should you have further questions about anything explained in this announcements or hard forks/chain-splits in general, feel free to ask us either on our bitcointalk thread, support email or directly on the site in our chatroom. Accept our challenge on Video Poker, Blackjack, Slots, Roulette, Dice, Plinko and win from 0.0001 to 0.07 BTC for each bet fulfilling requirements below! Video Poker BetID must be 3,540,110 or higher. Blackjack BetID must be 4,445,490 or higher. Slot BetID must be 20,525,100 or higher. Roulette BetID must be 6,144,766 or higher. Dice BetID must be 2,154,290,000 or higher. Hit Payout 10, 20 and 50. Plinko BetID must be 5,042,762 or higher. Each win will be awarded once. 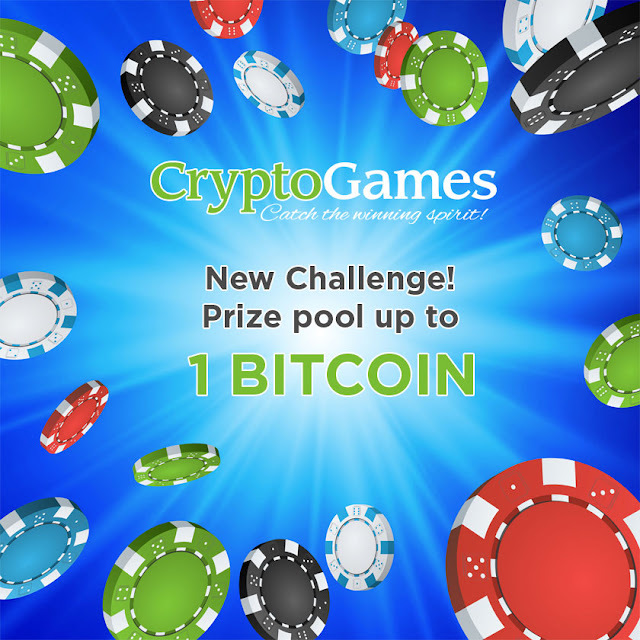 Each challenge is rewarded from 0.0001 to 0.07 BTC (depends on the game you played and bet amount) which will be added to your Crypto-Games account. Maximum of 28 rewards (5 rewards on Video poker, 5 rewards on Blackjack, 5 rewards on Slot, 5 rewards on Roulette, 5 rewards on Dice and 3 rewards on Plinko) will be dealt. Only bets with Bitcoin are part of this promotion. Claims will only be valid on the bitcointalk forum. When you hit it, post your BetID(s) in this thread with your nickname on Crypto-Games and game you played. 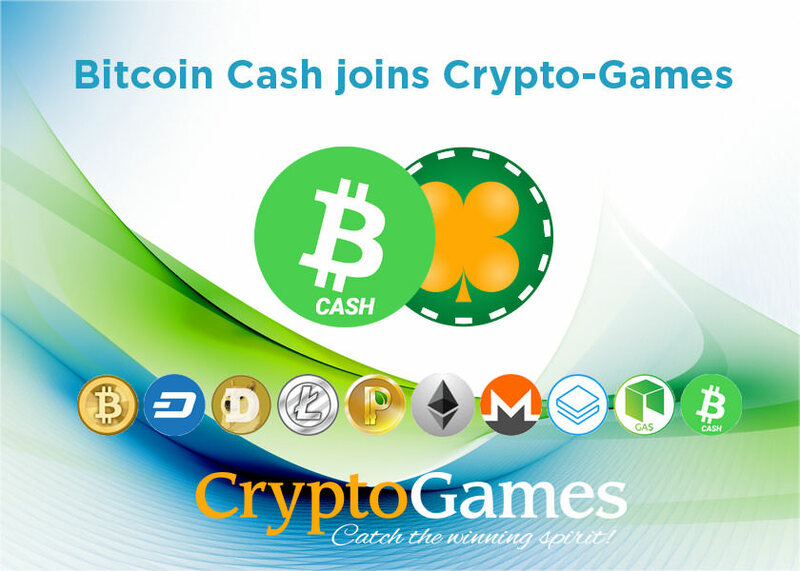 By popular demand, Crypto-Games is proud to announce the addition of Bitcoin Cash to our coin family. Users can now use Bitcoin Cash to play all our games available (excluding Lotto), invest in our bankroll, tip players, and exchange coins. This, along with our upcoming coin Stellar Lumens (XLM), were chosen by our users via a Strawpoll vote. Originally, the plan was to pick only one, but, due to the overwhelming support for both BCH and XLM, we opted to add the two in order to please the majority of our users. Back in August of last year, we paid out our users when the BTC/BCH hard-fork occurred, and we stated that we were not going to list or support the coin. We changed our minds because of you, and we hope you enjoy our new selection of coins! We're using the new CashAddr Address format. Here's an example of such address: qpm2qsznhks23z7629mms6s4cwef74vcwvy22gdx6a Players can still withdraw to old "legacy" addresses, using the converter tools (https://cashaddr.bitcoincash.org or https://cashaddress.github.io) if service/wallet is not yet supporting new address format. As stated few weeks ago, we'll now finally remove Gridcoin from the site. After April 11th, 12:00 UTC it will no longer be possible to place bets with Gridcoin or request withdrawals of any leftover balances.